We decided to put up our latest How-To's a little ahead of schedule so you could get started on some new ideas and projects early. The paper projects use some great new paper from Basic Grey called Eskimo Kisses. In the weeks to come we'll show you some more ideas to do with Eskimo Kisses. 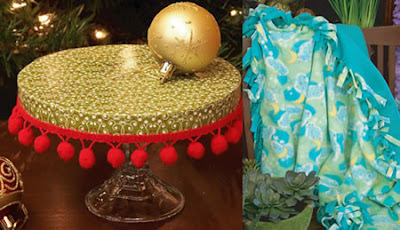 This month our stores have fleece on sale, so what better time to make this easy No Sew Fleece Blanket. Great gift idea! What have you been making lately? Christmas decorations or gifts? Our blog community would love some more inspiration - post a link to your project! FREE Make & Take on Saturday!